When an unforeseen accident tramples her dreams, Selena trudges through a desert of loneliness caring for an invalid husband. Finding herself a widow at twenty-eight, she grasps at the chance to experience a new life. Answering an advertisement for a marriage of convenience, she agrees to the platonic arrangement in order to care for the man’s young son. Leaving her home in Illinois, she travels by train to Oregon to discover a very different world from the one she left behind. Mesmerized by the beauty of this new land, she finds faith and fulfillment, but she never expects to find love. Dirk lost his wife long before his son’s birth. Bitterness and pain solidified his emotions like the snowpack on Mt. Hood. He needs a mother for his son, but nothing more, so he places his request: No pictures necessary, references only. Selena agrees to the arrangement, but her heart interferes. Will Selena’s patient endurance be enough to melt her husband’s frozen heart? I'm always a sucker for a good mail-order bride story! I felt like this one really touched on the difficulties of life and the situations that would lead people to make the choice of both requesting a bride through mail and becoming one. Selena is desperate for some hope in her life for a change as well as a new purpose, and is blessed not only by Dirk's protection, but most especially by her new relationship with his young son. The joy of motherhood is sweet and treasured by Selena since she lost hope of it long ago. The friendship and partnership between she and Dirk develops naturally over time. While Selena welcomes love, Dirk is conflicted over feeling more for Selena than he is prepared to and his stubbornness in avoiding a deeper relationship was frustrating. It takes as long as the spring thaw for Dirk's frozen heart to melt and reward Selena's patience. 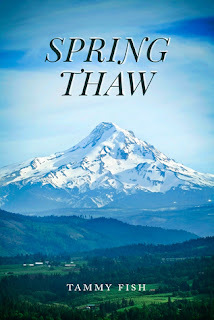 The author wonderfully describes the landscape of the Pacific Northwest, and I was fortunate to be on a road trip through the area as I read the book so it was easy to visualize the setting. The secondary cast of friends and neighbors are delightful and make the story well-rounded. I look forward to reading more by the author in the future.